Kids, especially boys, love toy airplanes...and they are so easy to make. You can make a toy airplane out of basically anything. You can, of course, make them out of paper, but you can also make them out of styrofoam, cardboard, wood, and other crafts supplies as well. Of course, you know that you can make toy airplanes and gliders out of paper....you probably have known how to do this every since you started elementary school. There are a lot of points when you are in school that you are bored and need something to pass the time. That is when paper airplanes are usually made...although most teachers don't allow them....but if you know how to make them, that is likely when and where you learned how to. Another fun toy airplane to make is one that is more just for pretend...ofr young kids such as preschoolers and other young kids. You can take a large cardboard box and cut a large hole in the top and bottom of it....then attach suspenders to the box so that you can wear the airplane around your waist. You can make wings, also out of cardboard....and then you can paint it to make it look like a real airplane. You probably have heard of styrofoam glider planes too. Just take a styrofoam food tray or plate and cut it into the shape of an airplane and make the back wing stick up. Cut a rectangle wing and cut a slit in the first shape to stick the wings through. If it doesnt' fly, try sticking a paper clip to the nose of the plane. Another good idea for making a toy airplane is to take a platic water bottle or soda bottle. Cut a slit on both sides of the bottle...then cut a wing out of cardboard or styrofoam. Now you can push the wing through both slits. Do the same thing for the back side wings. Also make a tail wing the same way. Then take paint and paint the airplane with windows and people in their - if it is a commercial plane. Another good idea to make an airplane...that won't fly but looks good...is to take a cardboard tube for the base of the airplane. Wrap it in a color of construction paper. Cut out construction paper wings and glue it to the tube. Cut a slit in the back of the tube and put a tail wing in the slit (after cutting one out of course). Cut out a propeller shape and glue it on the front of the plane. This is a great craft for younger children as it doesn't take a lot of skills to make. 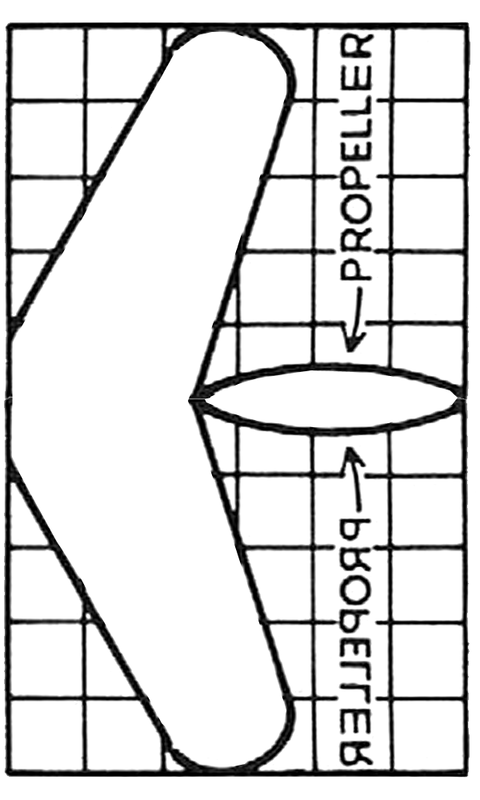 You can print out the wings and propellers template here and then cut them out (or you can use the diagram above to draw your own. Tape the wings to the clothespin as pictured above and then connect the propeller to the front of the clothespin with a thumbtac. Youc an decorate the plane if you want to. How to Make a Paper Airplane Glider in Easy Illustrated Steps Craft for Kids - Learn how to fold this amazing paper airplane glider that flies really, really far. All you need is a piece of paper and 2 paper clips. How to Fold a Paper Jet Airplane with Folding Pictures and Directions - There are 7 illustrated steps, that are also lettered to make it as easy to follow as possible for kids and others. You might want to actually letter your paper to make it easier for you to follow. Ask for your parents help if you can’t follow the pictures. Have fun. Making Paper Airplane Shooters - Find out how to make this paper airplane shooter with this easy woodworking project. Propel your paper airplanes! Super Fast Airplanes : Paper Darts - Learn how to make these paper darts. How to Make a Mini Zip Line Moving Air Flying Toy - This is a really cool toy idea…one that can be changed for a lot of different variations of moving toys. This is an air ship / space ship zip line moving toy. Find out how to make this zip line toy that zips and moves, by reading the step by step, illustrated instructions below in our crafts project tutorial. Clothespin Airplane Toy - Learn how to make this clothespin airplane toy. Fast Straight Paper Airplanes - Find out how to fold these super fast paper airplanes.